PM motors, aka brushed motors, are still the electric motor of choice for RC model boats. Their strength is their extremely low cost, if you know where to look. 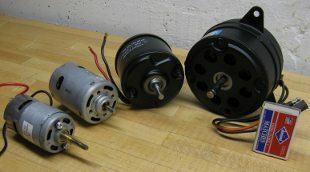 Surplus permanent magnet motors - from left: 700-size with ball bearings, "mini-EV", and two automotive fan motors. 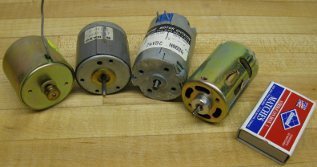 Are the permanent magnet motors going extinct as RC model boat motors? Not yet, I don't think. They are well on their way for RC airplanes and helicopters, and just starting to get pushed aside among RC cars and trucks. The threat of course is the invasion of brushless motors. If we look at performance, PM motors lose against brushless motors point by point, except in one important area. Price. A decent brushless motor and ESC combo for RC boats will typically set you back $200. The cheapest permanent magnet DC motor setup will cost you less than $10. It won't compete with the brushless boat on the pond, but you'll have plenty of money to spend on the rest of the boat or some well needed tools for instance. Conventional motors for RC applications are almost exclusively permanent magnet motors. They have been around for decades. Technically, their weakness are in the brushes. What are brushes? You may ask. Well, let me try and explain it without being too technical. To operate remotely we need to carry batteries. The only form of electricity that can be stored is direct current, or DC. In order to rotate continuously an electric motor needs alternating current (AC) into its windings (otherwise known as armature or rotor). The DC-AC conversion is taken care of by a commutator, where the brushes are the main components. In a conventional RC electric motor the electromagnetic coils are part of the rotor. This design is problematic, because it requires an electric connection where the connected entities are slipping against each other rather than being firmly attached. To ensure that the electrical connection is adequate, the brushes have to be spring-loaded against the rotor. The spring force is a source of friction. This friction is drag on the system and will bring down the efficiency and cause heat to generate. So in short, there are wear issues and less than ideal efficiency. The heat may ruin the motor or shorten it's useful life. The fix can be a water cooling jacket. It will improve the efficiency by a small, but noticeable amount. The reduced heat will likely double the life of the motor. To control a permanent magnet motor you'll also need a speed control. This can be as simple as a switch or an H-bridge of switches operated by a servo or an electronic speed control (ESC). Despite all the drawbacks, the greatest benefit of the conventional RC electric motors is their low cost, if you know where to look. Read on. The classic Mabuchi RS-540 is probably the iphone of electric motors for RC products. The design has since become widely copied and sold to hobbyists under names such as Robbe, Graupner, Kyosho and many other. Its popularity has been driven mostly by RC cars and trucks. It may well be a good and economical choice for a home grown racing boat. For scale and sport model boats the five-pole cousin, the Mabuchi RS-550 may be a better fit. So what's the difference? Well, the RS-550 has more poles (five vs. four), and as a result will run smoother with more torque. The end result is that a direct-drive RS-550 can swing a bigger propeller with steeper pitch than an RS-540. In general, more poles on the motor makes it run smoother, quieter, and more efficiently. Electric motors seems to have come down in price over the last few years, even for the RC market. Today you can buy a new Graupner RS-550 for about $15, which isn't bad. A Dumas electric motor can set you back $65. Now it's starting to hurt. I've found that industrial surplus motors can be a real bargain. I've recently found brand new Mabuchi RS-555 (a low power cousin to RS-550) motors for $3.50 each. The biggest issue is that good motors seems to hit the market in spurts, so there will be dry-spells. As a result I tend to stockpile when a good contender appear. Read the description – compare the size (length, width and shaft diameter) with a comparable hobby motor you are familiar with. Many hobby retailers are good at specifying the size of their motors on their websites. I like Tower Hobbies for this. For fast model boats, look for voltages in the 6-12 Volt range and no-load current of 500mA or higher for possible candidates. Accept lower currents (down to 50mA) for displacing hulls (tugs, trawlers, battleships etc.). If you are looking for speedy motors for planing hulls, examine images of the motors for ventilation holes in the front face and sides of the end bell. Also look for any mention of built in fans in description – signs of high power. Examine descriptions for 5-pole motors for more torque – desirable for direct-drive scale and sport boats. Sometimes intended use is a good indicator. For instance, VCR and tape recorder motors need to run very smooth and quiet, but not with high power. This is useful for scale RC boats. Motors for power tools are typically high power. Make sure the motor you are considering has a shaft that is compatible with the coupling or other power transfer (coupling, belt pulley, pinion, sheave, sprocket etc) you intend to use.